Our world, on the technology front, has changed drastically in the past couple decades. We live in a society that has become reliant on constant internet connection. People use the latest advanced mobile technology to go about business for both personal and professional matters and more often the lines between work and play have become blurred. This revolution of having entertainment and instant gratification at all times has fueled the birth of gamification in the workplace, something that is turning into a massive movement due to the great impact it can have on improving overall employee satisfaction and company well-being. Gamification is a term used to describe the implementation of gaming elements, concepts, design and themes into an arena that is not solely or traditionally dedicated to house games. It can take place in areas such as education, life management activities (e.g., budgeting) or even on the job, and comes in various forms that mostly rely on the latest technology to execute. Gamification in the workplace is not a new idea. Whether it’s hosting seminars, throwing work outings to augment the company culture, or giving bonuses to whoever makes the most sales, businesses are continually looking for ways to improve the office environment. The fairly recent boom in technology has really aided gamification at work to hit the next level of effectiveness and address the essential goal of employee engagement. When an employee is invested and encouraged to do the work they do, it will lead to better productivity, personal happiness and thus an ultimate gain for the company. Thanks to rapid innovation in synced and mobile technology, businesses are able to capitalize on the ever-growing use of technology. Game applications have been built around real-time data and employee behavior and the exchange of information is instantaneous, paving the way for leaderboards and up-to-date notifications to give constant encouragement at work via digital platform. Companies are using gaming to engage their personnel within three major areas of concern and that’s education, creativity and enthusiasm—all in which if hit, can improve engagement. In the business of medicine, gamification can be used to educate medical staff. For instance, physicians who need to brush up on current medical research can expand their knowledge through serious games (games made to teach users a certain topic) on their smartphones. Rewards and levels are included in these types of games to give users goals to complete while they indirectly learn necessary material and skills for work. LivingSocial and Spotify have tapped into creative gamification to up their participation of annual reviews, replacing them with a mobile game solution. Enthusiasm can be triggered with games as well. Target implemented a game for cashiers that shows their accuracy in how well they scan—falling into the red zone on the leadership board means there’s room for improvement while the green zone indicates optimum scan time and efficiency. This type of gamification is made possible because of the ability to capture scan times automatically with cloud computing and dually motivates shop-floor employees to find ways of optimization in what can seem like the most minute tasks, but are sometimes the most crucial operational components to a well-run business. The benefits of gamification in the workplace are endless. It opens the door to fast feedback and transparency as well as provides employees with goals, competition, community and collaboration. 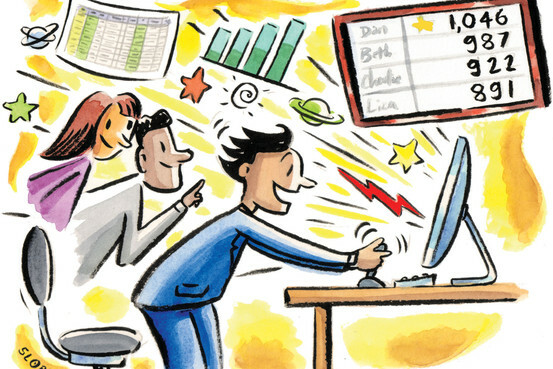 Gamification helps to humanize work and blend the lines between personal fulfillment and professional productivity. With technology at the forefront of pushing the momentum of workplace gamification forward, the evolution of the office space will come full circle in the very near future.